We have used many different LED lights and the Vervve is by far one of the nicest looking and easiest to use LED units on the market. 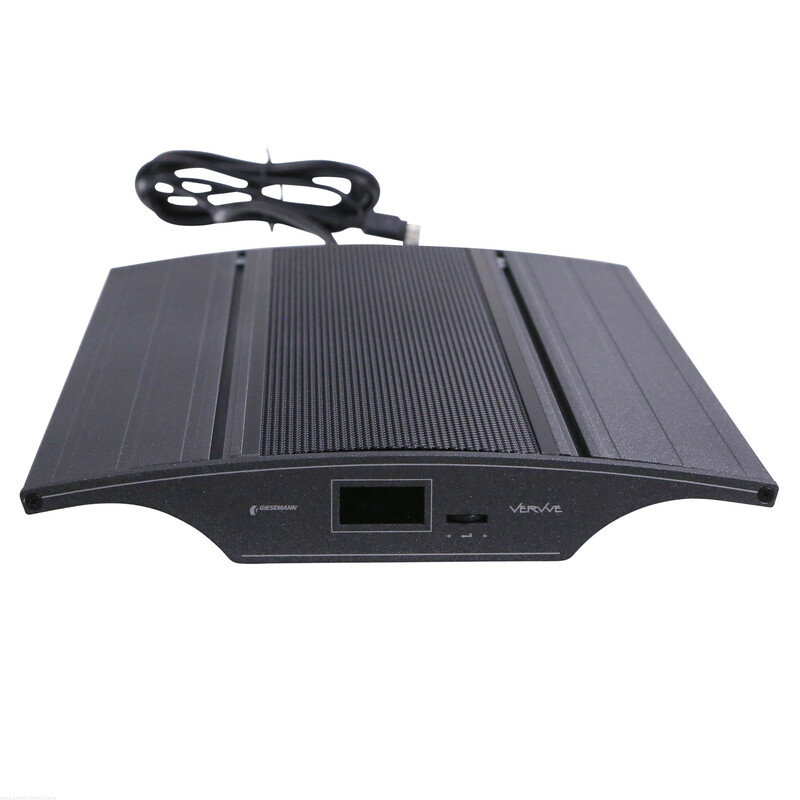 The onboard interface allows you to fully control and program the light without any need for an additional controller. If you dont have any need for an external controller Giesemann gives you the option to purchase an LED without bluetooth built in keeping overall costs lower, saving you money. If you have a larger tank and want to expand to have multiple Vervve modules you simply only need a single Plus unit and that will allow you to control up to 99 Vervve One modules. 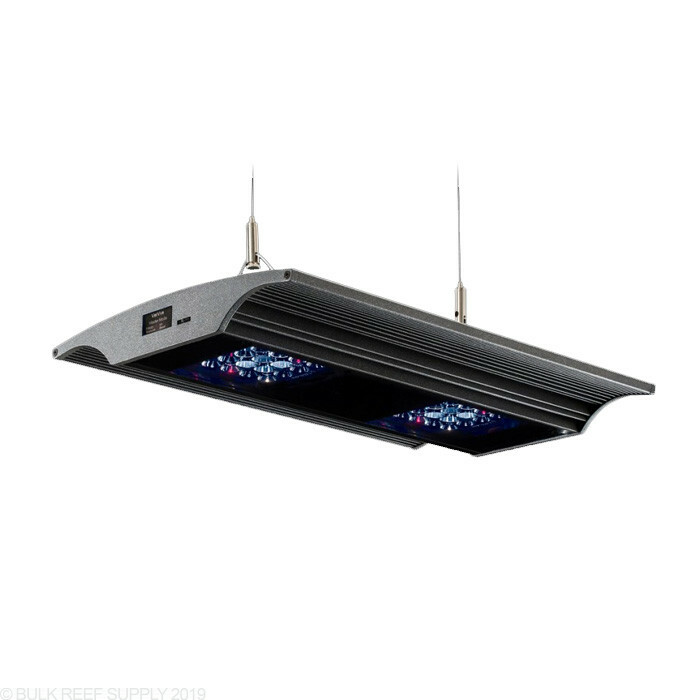 Another feature that we really like is instead of taking a plain, off the shelf housing and heat-sink Giesemann custom produced their own heat-sink that doubles as the housing allowing the LED's to stay cool and lasting much longer. Dimensions - L 13.7" x W 9.8" x H 1.35"
Please use the Giesemann 260mm Hanging kit for VerVve LED fixtures. *IOS app available now. Android app coming soon. 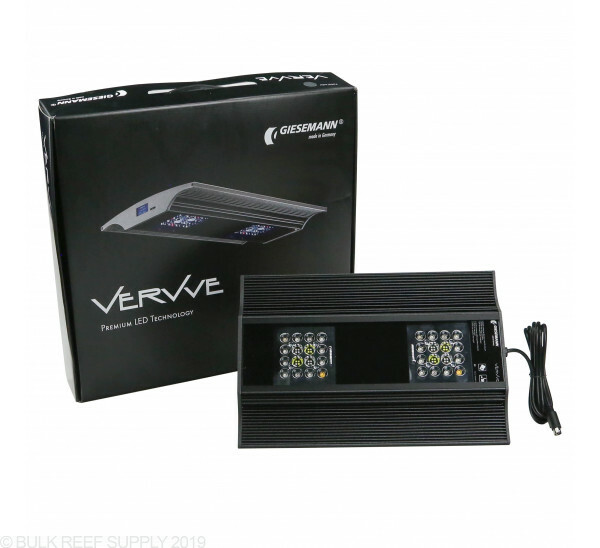 The VerVve One LED Fixture can be used on its own, without the need for any additional controllers because it does have a built-in control interface on the fixture itself. If you do need multiple VerVve fixtures to work in unison, you will need to use the VerVve Plus model as the master fixture and the One model would be its slave fixture. The VerVve fixtures are manufactured in Germany which allows strict quality control, and use of the best components available. With a body made of an aluminum/magnesium allow it is elegantly handcrafted with superior components. Forget about messy wires, costly adapters and complicated WiFi router setups.The VerVve PLUS communicates wirelessly with other VerVve ONE fixtures without any additional routers or devices. 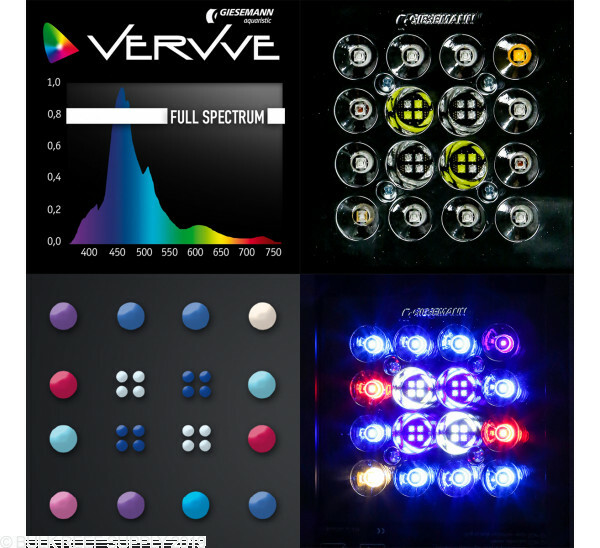 The VerVve PLUS software runs independently on a mobile device or computer and becomes your all-in-one control center for your lighting system. The VerVve PLUS uses the invincible and reliable BLUETOOTH connection. 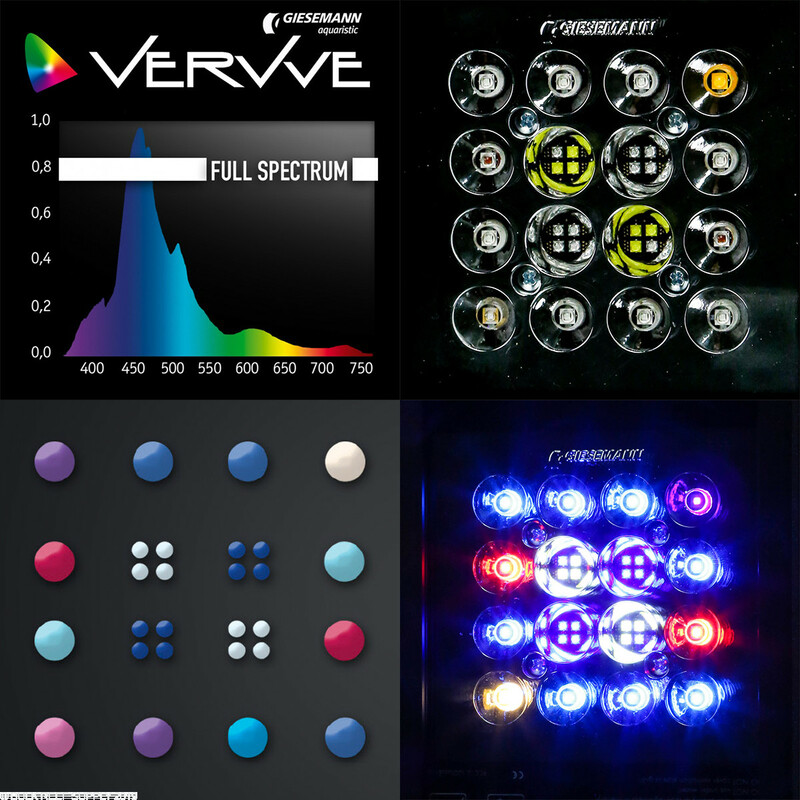 The VerVve’s 1450 programmable set points provide realistic daylight intensity adjustments over the full spectrum and light cycle. Replicate realistic sunrise to sunset phases, daytime high-intensity period, lunar cycles and even sun shifts (moving the focal point of intensity). I picked up two of these fixtures the other week. I was not impressed with the price but after lot of research I dropped the 1,400 dollars on two of them. I was looking for an upgrade to my lighting system to take my coral and ocean setting to the next step in the hobby. Out of the box the fixtures live up to the quality and reputation I have read about. Beautifully crafted and well manufactured. Setup took a little bit longer than a normal fixture, both of them installed and running in about 57 minutes. longest part of setup was the Bluetooth and programming features. Instructions were easy to read and guide you well. So far the pre-programmed settings on the lights are impressive with more transitions of real ocean lighting than I have seen on other fixtures. I will add additional reviews as I use them more and play with the settings. Bottom line Spend the money It is well worth it and the product is a quality component not just advertising. My Plus arrived today... it's a good looking unit. The fan is very quiet, the finishes and materials all look good. I'm more concerned about the power supply finish than the fixture, since it's not powder coated, but it looks and feels overbuilt, but not clunky. The profile looks really good... the whole unit looks great from all angles. Display is great, and the interface system (menus and such) was pretty easy to navigate (more on that), but the control feels a little cheap (think cheap radio plastic volume dial). It wasn't to difficult to use, just "left", "right", and "push". If I have to use it for everything it's going to be tiresome (more on that, too). No Android app: the manual says Feb 2016, the Giesemann VervVe page says April. Their download page shows Apple phone and OS-X, no Android or PC, and no mention. All other software has all 4 platforms available... good thing this is for a yet to be setup tank! Also wish there was something in the way of mounting in the box, but I already knew that (of course the mounting arm isn't available yet) - the perils of early adoption! 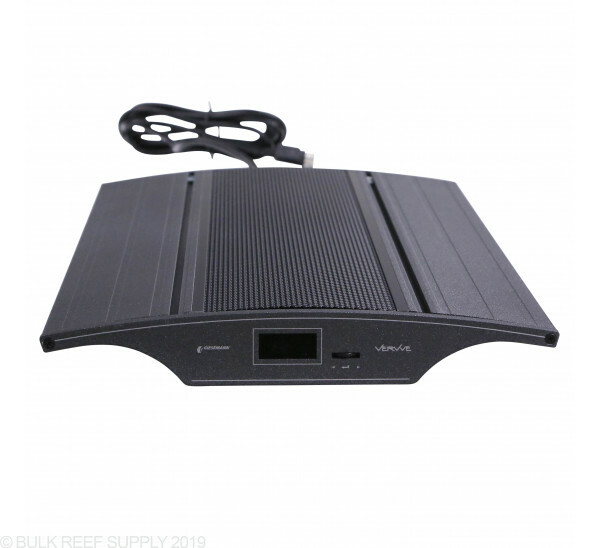 First impressions are still genuinely good... the output is impressive (I swear I could get a tan from the UV channel), and the built in cooling fan is a great addition (and did I say quiet?!)... my current led setup is fixed heat sink. I did a quick check over my 75 gal, and saw colors in my Coral Beauty I hadn't seen before... very much looking forward to having this over a 60 cube in a few short months! How many fixtures would be needed on a 6ft 210 tank? For best spread, growth, and penetration 3 would be recommended, 2 could work for less intensity and spread. 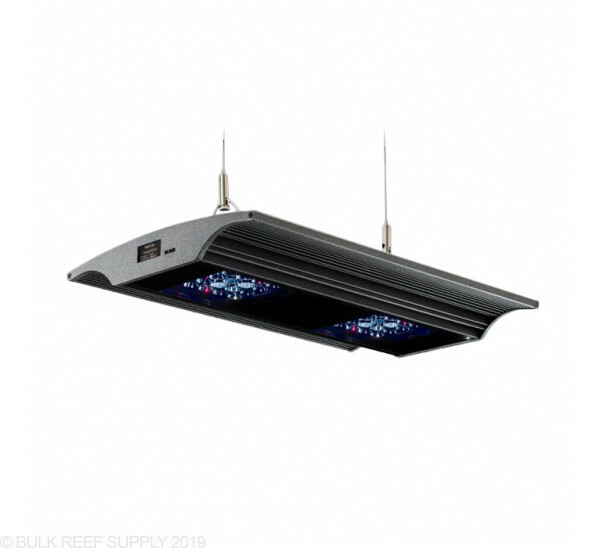 This light will work great over the Reefer 170. It can have a max spread of 30" x 24" and less when mounted only 6" above the tank. You can run the intensity at a lower amount 30-40 % for best growth.